History: Breaker (CTW Breakout) is the third dog from the “BR” litter (all pups’ names begin with “Br”) that TAGS has taken into its system. He joins Broken Angel (Angel) and Brain Game (Braden, now Tully). Both of them have been adopted into their forever homes. 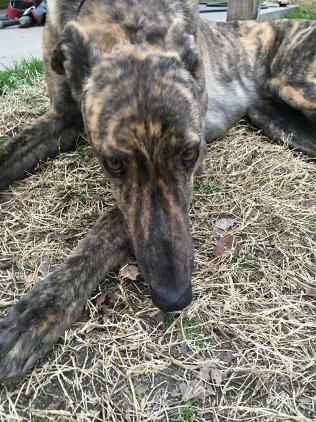 Breaker, like some of his littermates, were not for racing, so he has spent his short life on the farm. He had a somewhat traumatic first day, but has settled into his foster home easily. 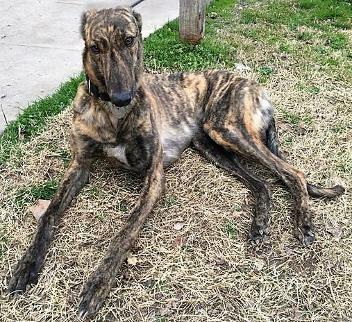 He is in a home with one other Greyhound and two small/medium dogs. 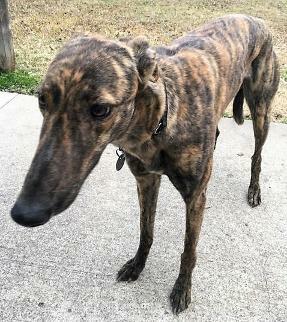 He is learning the drill and one of his first lessons was, “If there is a free human hand it should be used for petting me.” Visit with Breaker and see if he could be your “forever hound.”. 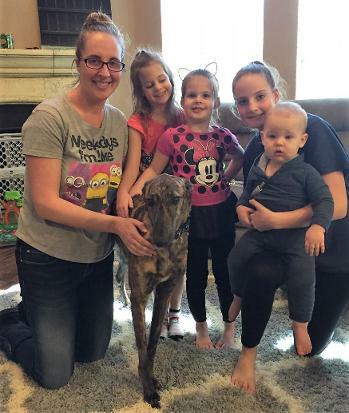 Breaker found his forever pack with the Griffith Family. March 15, 2019 update: Breaker has found his forever home with 8 people to love on him. Congrats to all!! January 24, 2019 update: Breaker came to TAGS for a life of retirement and to find his loving lifetime home.